Small businesses are faced with many hurdles from the initial idea conceptualization of their business to the variety of daily challenges faced with running their own business. 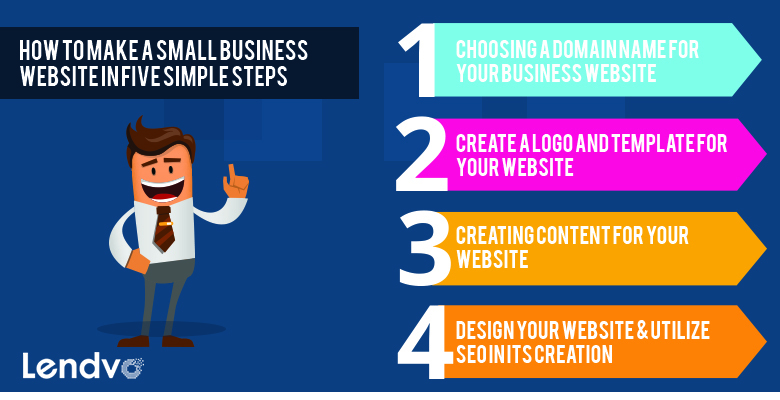 One of the most common hurdles for small business owners is the act of building their own website; in fact, half of small businesses still do not have their own website. Businesses with 1-10 employees and less than $1 million in annual revenue are a viable representation of small businesses; 54 percent of small businesses currently have a website and 46 percent do not have a website as of 2016 according to the United State Census Bureau. . The financial challenge of building a website is one of the most common reasons provided by small business owners for not having built a website to date. In the modern era, your website may not have been an essential asset to your business, but the fact is, in this day and age it is easier than ever and there are more cost effective ways to build a website than there have been in the past. If you haven’t built your website yet, we have laid out some of the most important aspects that come with building your own website and launching yourself into the online business world. Choosing a Domain Name for your Business Website. There are many situations where your business’ actual name’s domain may be taken and if this is the case, there are options to incorporate your business name into another domain name that may be available. For example, if the .COM version of your business name is unavailable, an option is to add the city name to the end of your business’ name (i.e. www.MyBusinessNYC.com). This decision will actually improve your SEO visibility when people use search engines locally. .COM is usually the most chosen version of search for consumers when entering a web address. If you do end up using .NET, you may lose customers who entered the .COM version instead. Another option, usually used by nonprofits is an .ORG website. B.) Domain names are essential for search engines, like Google and Bing. Using words that people are more common to search when looking for a business like yours and the products you provide will be beneficial to acquiring new customers. “MyBusiness Basketball Sneakers” will serve you better than “MyBusiness America” America because if Basketball Sneakers are the product you are selling and MyBusiness was your business name, the SEO for your domain name is better because of the data included in the domain name. D.) Registering a Domain. There are many domain name services to choose from including, Bluehost (about $12/year with option to add business email address for $2.95), GoDaddy, Igloo, Weebly, Sedo and so forth. Domain purchasing websites also exist like Uddem which can service all your domain brokerage needs and can help with idea creation when selling, buying and transferring a Doman. Whereas GoDaddy and Weebly are common domain name purchasing websites that allow for an array of price options based on your needs in addition to offering you the ability to create your own website. SEDO is a website that allows you to buy domains or take a more personalized approach to work wit a broker, similar to that of Uddem. A.) Deciding on a logo and creating a marketing strategy that you want to implement into your website is essential. Your logo represents who you are as a brand. Your logo and the content of your website should match each other to some extent. It is important the colors, style font and design of your logo and web pages work synchronously with the design of your website. The level of consistency between your logo and website is important to the conceptualization customers get of what your business is. Creating a high resolution scan as a digital file is a common tactic in doing this. If you do not have a logo or want to upgrade from what you do have, there are several ways to do so. 99Designs.com, Fiverr and Constant Contact all create logo. Graphic Springs is an option that does not charge. B.) Next you will want to choose a template for your website. This part is about creating the image you are going for as an online business and keeping it close to your business model. No matter which platform you decided to use to build your website you will want to choose a template so you do not have to create each page from nowhere. Your template will determine the location of the logos, headers, footers and sidebars as well as the width of your content area and so forth. Adding and rearranging content comes later, but you want to make sure you choose a template that works with your template and project. Choose one you like to represent your business because it will be consistent on each page. Once you make these decisions and are building the website later on, you will have a better idea of what you want to create when you enter the website builder you choose. B.) Homepage is where you include your business name, your location and a condensed logline and pitch of your business’ services that should focus on why what you offer is unique and customers should you and not your competition for the service you proved. This is your introduction to your customer and it should be sleek, concise and informative of your business. C.) Business Services is the page with focuses more in detail on the services you provide or products you sell. Several sentences, no more than five, are needed here to describe each type of service you provide. This is the information age and people go from page to page, or template to template, in terms of talking about your new website, quickly. The information needs to be bullet points or in small paragraph form to keep your customer interested. D.) About Us is where you offer potential customers your company background, the information on your founders and team as well as list any organizational memberships you have like being a member of the Better Business Bureau. It is best to list more here about the qualifications of your team, including which University everyone attended as well as any awards team members may have. E.) Contact Us is where you include your address, phone number, email, the hours you are open for business and any other locations your business may have. Also note you are available for meetings outside your office if that is something you offer. Including a Google map of your location and the modes of transportation to get there is beneficial. Depending on if you are in an urban or rural location, it is good to provide routes and public transportation options. F.) Customer Testimonials can be included in the ‘About Us’ section or the upcoming ‘Contact Us’ section. This is a good way to share positive referrals and experiences customers have had with you. Yelp is a site which gained popularity solely on the business of referrals and this shows how unbelievably important it is for you as a business owner to include your positive reviews on your website for potential customers to see when they compare your services to other businesses in the same fields. Websites are mostly built online, but about half the customers viewing websites do so from their mobile phones. If you are building your website as a small business owner, you want to make sure it is mobile-friendly for your users. Most of the websites we mentioned above like Weebly and GoDaddy create mobile-optimized websites for you. These sites are known as being website responsive because programmers have already made them readable when people view them on their phones. Even so, making modifications to your website is a good idea. Removing excessive details and having a focus on a Call-to-Action is essential. A Call-to-Action is something you use to get visitors to contact your business by filling out a contact form, making an online order or joining a mailing list. Now that you have decided what sort of content you want to include in your website, finalized a logo and conceptualized what may be the best domain for you, it is time to choose your provider and move forward with either building the website on your own through a DIY Web Builder, a WordPress website or hiring a professional to work with you to create your best possible online presence possible. SEO is an integral component in your website creation and the content you will create so it is important to evaluate your level of comfort with different websites, especially if you believe you will write the content for the pages yourself and blog on them on a daily and/or weekly basis to give your customers’ updates on your business’ progress. Here is a good link of SEO must-haves. Hiring a professional is your option as someone who creates websites for a living will probably have more expertise than you. This is up to you, as the business owner, based on your comfort level with your own skills as a website builder. There are great benefits to hiring a professional as they have knowledge of SEO, social media and other strategy to create a successful website. These professionals are usually programmers. They also may be a freelance website designer who can take your logo and the outline for the templates and content you have in mind and give you some sort of a deal. They can additionally create it on WordPress, teach you how to use this allowing you to then log in and make edits once they finish. Creating a website through a Do It Yourself platform is another great option. This consists of using an online tool, another website, to design your own website. This is where you will put into place the selection of the templates we mentioned above. This allows you the ability to curate your own pages on the website. The template you choose, in most situations will remain uniform throughout your website. So any of the pages including the ‘Homepage’, ‘About Us’, ‘Contact Us’, ‘Business Services’ will be represented on the same template format as one another allowing your website to have a desired fluidity and greater readability. WordPress is a specific way to create a DIY website that is a bit more advanced than some other options. There is somewhat of a learning curve to understand the WordPress publishing system, but it is learnable over time. It is inexpensive and provides you with a lot of tools and integration systems for utilization of SEO than some other websites. This is one of the first and post popular options to create a website and if you are creating a website focusing heavily on blogs with a lot of entries, this will allow you to gain visitors, increase readership and create an online forum. SEO is now something that is possible for anyone who has created a website; you do not necessarily have to be a programmer or website designer. Google Analytics are a great way to keep track of which keywords you are using on your website are receiving more hits than others and your website’s overall performance. This is a developing process and the more hits you have, the better. Taglines and calls-to-action should be six to ten words. This is how you get clients to click on and access your website. Each page’s word count should be 200-450 words. When all is said and done, your website is the face of your company to the online stratosphere and the fact of the matter is that most business is done online now and even if your business is not operating as an e-commerce platform, having an online presence for your business is essential to your growth as a business and future success. Creating a website is not necessarily an easy process, but once you have created your website, you will be excited and proud to share it with the world and continuously make it better.